The Challenge: Few Americans walk or ride a bicycle as a part of their daily routine. Most rely on their automobiles to go to work, shop for groceries, or just get around. As a result, “active travel,” such as walking or biking for routine trips, is not a significant part of daily life for most Americans, providing little, if any, regular physical activity. Make an impact: Active travel can be a significant source of regular physical activity when built into daily routines, and in most cases, it requires few skills, little extra time, and is inexpensive. Most daily trips are within easy walking or biking distance. What the findings are about: This research review summarizes evidence on the health benefits and safety of active travel, and examines policies and programs that can help increase active travel. The health benefits of physical activity in general have been well-documented by hundreds of studies. More recently, a growing number of studies have confirmed such benefits specifically for transport-related walking and cycling. The health benefits of active transportation exceed its risks of injury and exposure to air pollution. Safety is a key consideration for promoting active travel. Importantly, places with higher levels of walking and cycling also have greater safety for pedestrians. Provision of convenient, safe, and connected walking and cycling infrastructure is at the core of promoting active travel. Aside from specific infrastructure for cyclists and pedestrians, the way neighborhoods and communities are built affects levels of active travel. Walking or biking for daily travel needs can be promoted as a convenient and competitive option through programs that shift travel behavior. Policies that improve public transport, or make car use less attractive, increase the competitiveness of active travel modes. Policies to promote active travel will work best when implemented in comprehensive packages; these may include infrastructure and facility improvements, pricing policies, and education programs to achieve substantial shifts towards active modes. 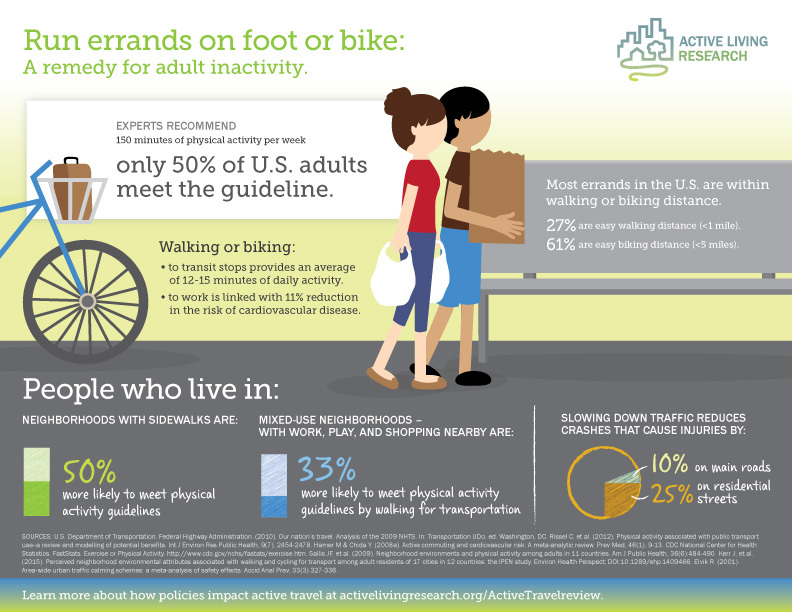 Findings presented in this research review are also available in the related Run Errands on Foot or Bike: A Remedy for Adult Inactivity infographic. Buehler, R, Götschi, T, Winters, M. Moving Toward Active Transportation: How Policies Can Encourage Walking and Bicycling. San Diego, CA: Active Living Research; 2016. Available at www.activelivingresearch.org.